August | 2011 | ohdenny. I was given this recipe from my sister who bought an entire book dedicated to cookies called The Golden Book of Cookies. Nuts, coffee and chocolate were an appealing combination so I asked her to send me the recipe so I could try it out. We had to make some alterations to the recipe. 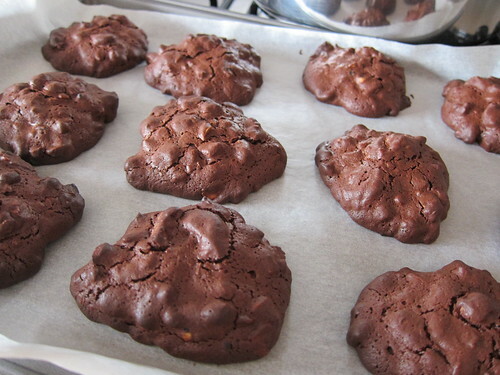 One: all cookie recipes appear to be ridiculously sweet so we cut down on sugar and chocolate. My mother’s love of nuts and something crunchy knows no bounds, so of course extra nuts were added. I found these to be quite good if you like crunchy chocolate and nuts cookies, with a hint of coffee. 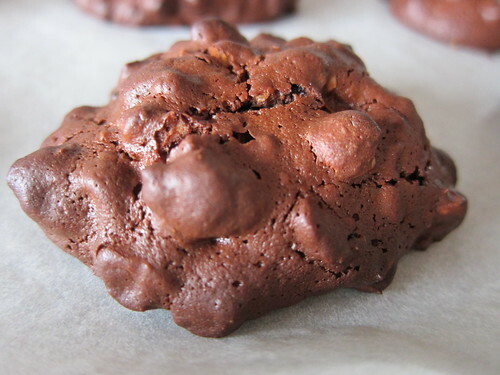 With less chocolates added, it still has a great chocolate flavour but it doesn’t overpower the whole cookie. Quite an easy recipe to follow too. I only had a horrible time trying to make them look nice and round, and with all the nuts it was quite a challenge. As you can see, I didn’t seem to fulfill my goal but they taste great nonetheless. Koko at Crown serves beautiful Japanese cuisine. Located a few floors above the famous Crown water fountains, and the Conservatory buffet restaurant. Koko would be considered slightly pricey but you definitely get your monies worth. Well we did anyway. 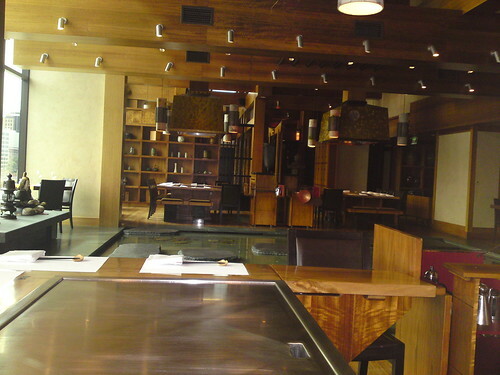 Their restaurant has a small water feature in the middle of the restaurant, surrounded by the Teppanyaki grills and tables. 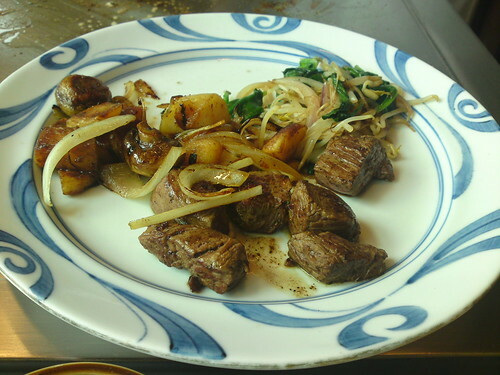 We ordered their set Teppanyaki Lunch set menus, but you can also order a la carte, and for dinner there is a different albeit more expensive teppanyaki sets’ for everyone to choose from. We ordered the Seafood, and Beef sets and you are welcomed by the lovely staff and also greeted by the chef who will be cooking your meal. A lovely touch! 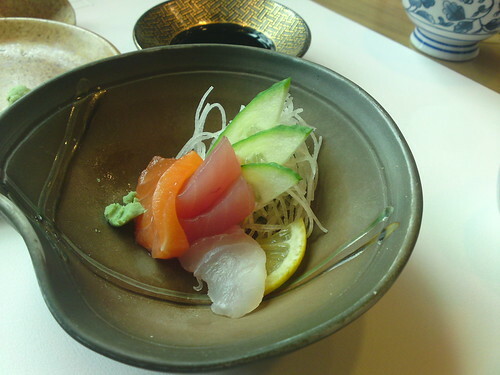 Each lunch set comes with appetisers and sashimi to start. 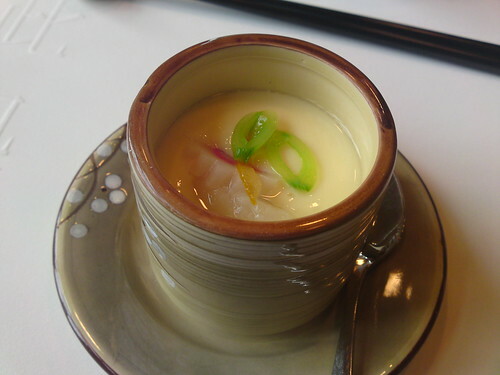 The special set comes with a warm egg pudding like entree. It was quite nice actually. 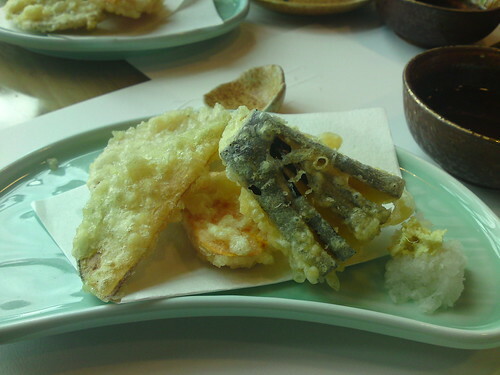 The vegetable tempura had a lovely thin but crispy batter, with the flavours of the vegetables still shining through. 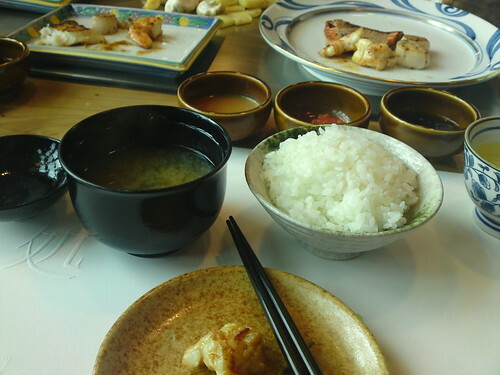 We are also served miso soup, rice and then the real fire starts! I don’t know why I never took pictures of the actual chef cooking our meals but do have an image of the end result. The three of us shared our sets so we could try a bit of everything. The beef was so soft and delicate, and packed full of flavour. The potatoes, mushrooms, spinach and bean sprouts all were delicious. I was definitely satisfied and full after all that. 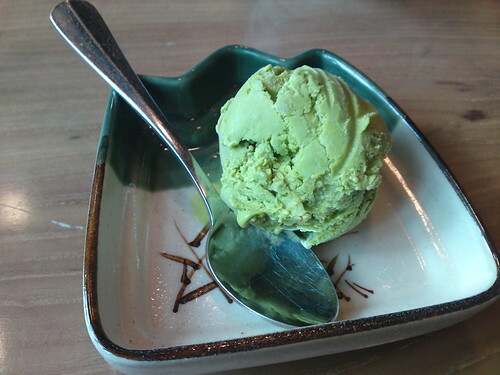 Last but not least was the Green Tea ice-cream and that is always a winner for me. Koko at Crown is definitely a great place to eat, I probably couldn’t afford to dine there regularly but it definitely will be on my list of great Melbourne restaurants to celebrate a special occassion. Great food, great atmosphere and great service. 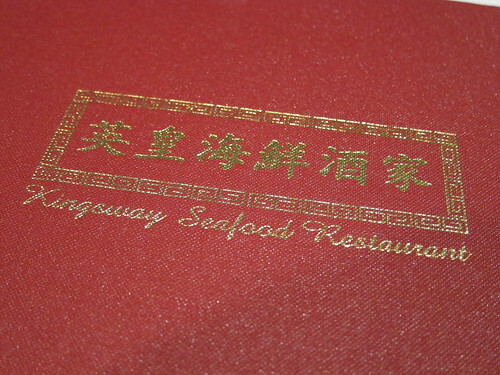 Kingsway Seafood Restaurant is a recent entry to the heart of Glen Waverley. Opening earlier this year, if my memory serves me correctly. There aren’t that many Chinese restaurants where you can have a nice dinner on Kingsway or near the train station. Maybe, the Hakka Teahouse across from Glen Waverley train station but the more the merrier I suppose. 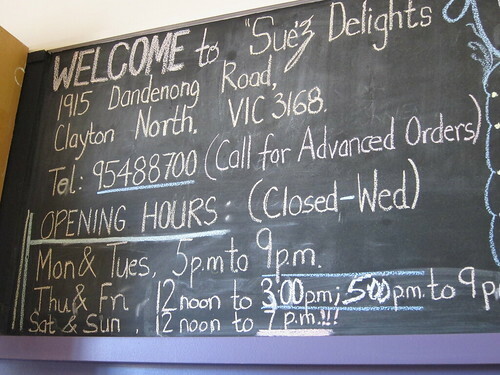 It also isn’t a bad thing that the prices are reasonable for what they serve and well the last Chinese dinner I had was at Eastern Palace in Rowville, and the bill left an unpleasant taste in our mouths. 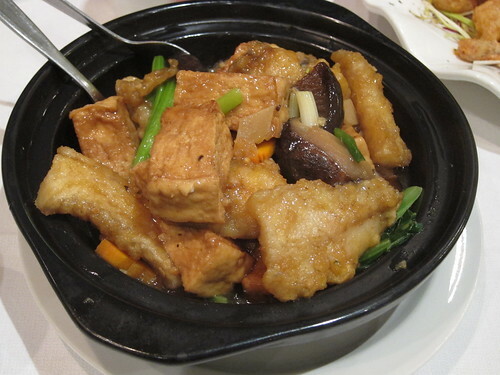 We orderd a fish and tofu dish for dinner and it had a nice taste to it, with cooked but crunchy carrots, vegetables and mushrooms. Overall it was quite pleasant. Nothing really to run home about, it basically is the standard flavours you may find in your typical Chinese restaurant. We also ordered another vegetable dish (Kai Lan with beef), and that was great but I didn’t managed to take a picture of it. 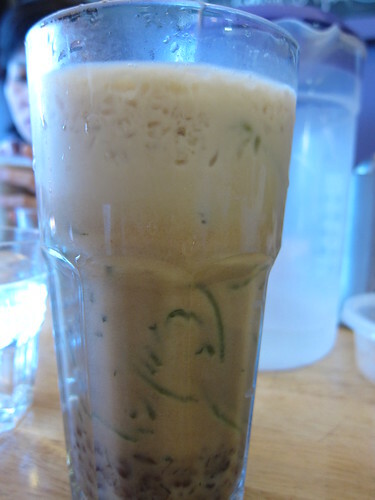 Not that it was picture worthy anyway since it was quite simple, but I love kai lan so we had to order it. However, this prawn dish was the standout. 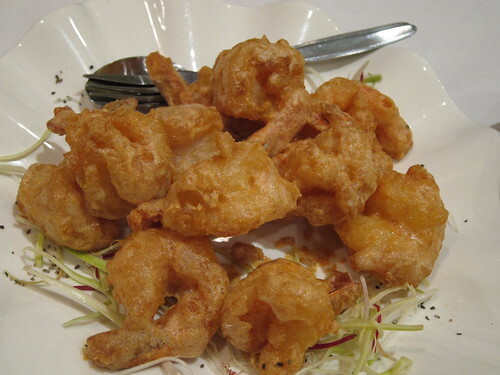 The prawns are covered in a salted egg batter and my golly was it something special. It had a great saltiness to the prawns, but the prawn flavour wasn’t overpowered by the salted egg batter. The batter thinly covered the whole prawn, and was light and crisp, and definitely not heavy that you feel you’re eating a great deal of oil. 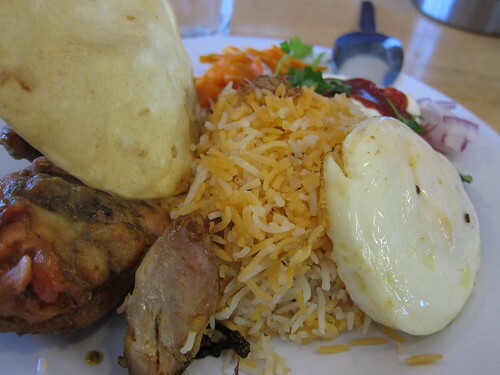 I think I would go back here just to order this delicious and surprisngly delightful dish again. I would probably only come here on special occassions though since if you eat regularly here, it would take quite a big chunk out of your food budget! It’s probably best if you freeze already browning bananas, I tend to peel my bananas before hand, put it into a bowl or container and just chuck it into the freezer. Once it’s frozen, use a blender, I would think a food processor would work the same but I haven’t tried, and you just keep blending it until it amazingly turns into ice-cream! You’d never think it would but somehow it magically transforms. 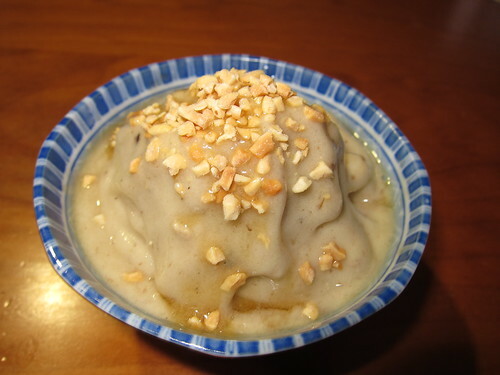 If you don’t like bananas all that much, this recipe isn’t going to be something you would want to try as I’ll warn you, it will be a strong flavoured banana icee/ice-cream. It also won’t be exactly like an ice-cream since it doesn’t have any cream but you can basically add anything to it, to give it added flavours or textures like I have. 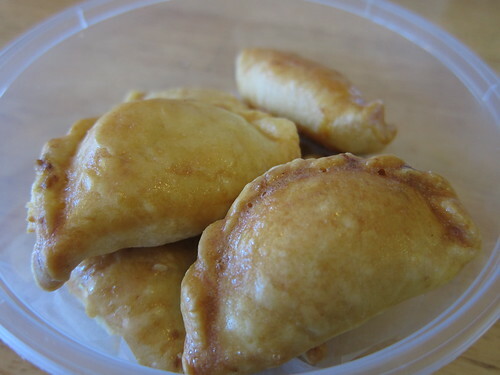 This site has added a scoopful of peanut butter! I just added a sprinkle of chopped peanuts and delicious maple syrup. Gosh it was nice and easy to make. My next mission is to buy an ice-cream maker. I don’t know when I will, but I would love to make my own real and fresh ice-cream.